The Kokoba Massage glove can be used to clean and massage when you’re bathing your cat or dog. 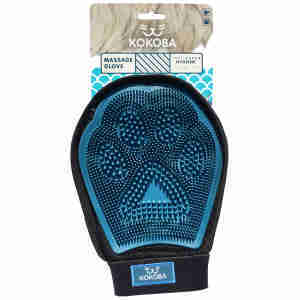 The Kokoba Massage Glove is a helpful bath time accessory for your pet. It has raised, rounded rubber tips that help get the shampoo through your dog’s fur for a deeper clean. The rubbing action of the glove also creates more foam and spreads the shampoo evenly. This massage glove can be used wet or dry – in the bath, or while grooming your pet. Used dry, it gets rid of dead hair and dirt in your pet’s fur, making it perfect for using between baths to keep their coat healthy. The rubber tips give your pet a gentle massage while they’re being groomed. With little applied pressure, this helps improve blood circulation and strengthens their skin. With a Velcro wrist strap, the Kokoba Massage Glove is comfortable to wear, adjust and remove. Velcro strap supports your wrist. To keep your pet’s fur in top condition, they need to be groomed regularly. If your pet has long hair, they might need a little extra attention to keep it healthy. When their fur becomes knotted, it can get matted with dirt and be very uncomfortable – regularly removing dead hair with this massage glove can help prevent this. Use the Kokoba Massage Glove in the bath to apply shampoo and conditioner. The deep penetrating action will give a professional finish and leave your pet’s coat shiny and dirt-free. The mitten itself was a brilliant thing. You only have to use it and the coat shines.